It is now apple season.The holidays are a perfect time to bake and create interesting apple dishes. Macintosh apples are the perfect apples for pies . It has a sweet/tart flavor. They are grown in New York state local farms. 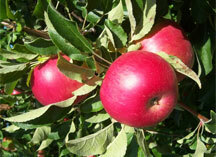 Red Jacket Orchards is a great farm that provides apples throughout local supermarkets. Their apples can be found at The Food Emporium in New York.